A one-of-a-kind gated community in North Tampa's Wesley Chapel neighborhood will become even more attractive and exclusive when the United States' first Crystal Lagoon is built as part of the Epperson development. Florida's first Crystal Lagoon is set to open in Wesley Chapel, with three others to follow nearby. One in Mirada, near SR 52, two in the Southshore area and one in Fort Myers. Outside of Florida, you find Crystal Lagoon projects across the globe including Dubai, Mexico, Chile, and Thailand. The 7.5 acre, environmentally sustainable pool will have its own private beach, swim-up bar-restaurant, kayak launch, playground with water slides, a beach dubbed Gasparilla Island, an obstacle course, and an entertainment stage. Scheduled to open in early spring, the man-made lagoon will feature 16 million gallons of purified water. The water will flow through three different four-inch hoses that measure more than six football fields long. The Pasco County utility department can pump 250,000 gallons of water into the pool each day. Filling the entire lagoon is expected to take 12 weeks. 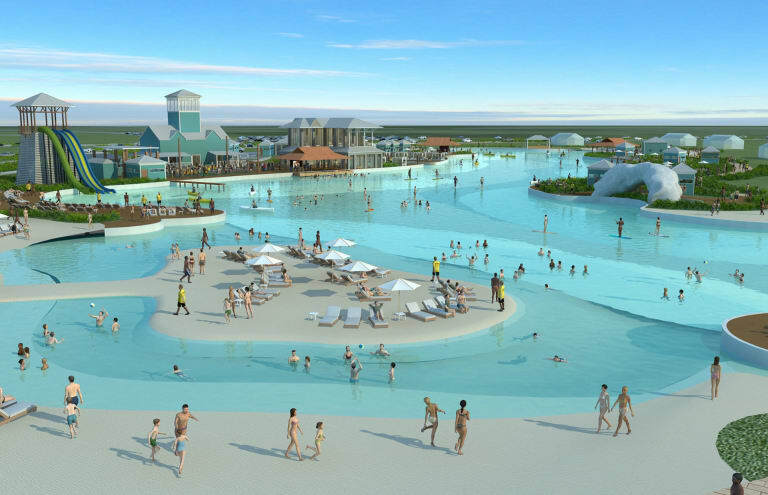 The Crystal Lagoon in Wesley Chapel will be 4,200 linear square feet in circumference, with an average water depth of approximately eight feet. Officials hope to attract corporate events, wedding ceremonies, and even watch parties for local sports teams like the Tampa Bay Buccaneers and Tampa Bay Lightning. The Crystal Lagoon in Wesley Chapel is sure to be the biggest amenity in the 2,000-home Epperson development, located at the intersection of Curley Road and Overpass Road. Epperson is a 15-minute drive from the Shops at Wiregrass and Tampa Premium Outlets. According to the developers' projections, Epperson is expected to become home to 96,000 people living in nearly 37,000 homes over the next five decades. The so-called "connected city corridor" covers 7,800 acres in central and eastern Pasco County, and is the first ultrafast gigabit community developed from the ground up. The nation's first Crystal Lagoon offers easy access to I-75 and State Road 54, and popular workplaces throughout the Tampa area, including downtown Tampa, MacDill Air Force Base and the University of South Florida. Epperson is convenient to local beaches, Raymond James Stadium, and the second-ranked airport in the country, Tampa International. It's encompassed by the up-and-coming town of Wesley Chapel, with exciting shopping destinations and excellent dining options. With the addition of the state-of-the-art Crystal Lagoon, Epperson is sure to be the new spot for both spring break visitors and house hunters looking for environmentally sustainable, tropical resort-style living.To learn more about communities and real estate in Tampa like Epperson, visit 813area and register for updates. It's free! Images courtesy of Pulte Homes.